NASA astronaut Barry "Butch" Wilmore (left) floats with ESA astronaut Samantha Cristoforetti (center) and NASA's Terry Virts (right) record a New Year's greeting on the International Space Station for people on Earth. The six astronauts living and working onboard the International Space Station may not be able to see fireworks on New Year's Eve, but they'll have a spectacular view of the whole Earth as they ring in 2015. 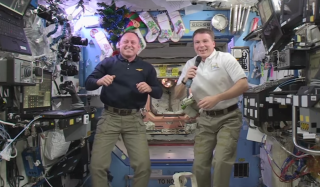 NASA astronauts Barry Wilmore and Terry Virts wished the people of Earth a happy New Year in a video recorded fro their post on the space station. Wilmore said he and the crew will celebrate New Year's 16 times since the space station will pass over a part of Earth celebrating midnight 16 times on New Year's Eve as the outpost orbits the planet. "We want wish everybody a happy, healthy, prosperous 2015 as we get the awesome privilege of celebrating New Year's up here on the space station with our crewmates," Virts said in the video message. Wilmore and Virts will be preparing for a spacewalk early in the New Year to change out the docking adapters outside the space station to receive incoming commercial spacecraft in the future. European Space Agency astronaut and station crewmember Samantha Cristoforettishared her New Year's resolution during an interview with CBS. Cristoforetti said she wants to do more video documenting of her experience onboard the station and share it with the public. Wilmore said his resolution is to be even more careful with each scientific experiment the crew carries out on a day-to-day basis. He wants to "try to pay better attention to every step of every procedure so we get it all right." Wilmore, Virts and Cristoforetti are currently joined on the station by cosmonauts Anton Shkaplerov, Elena Serova and Alexander Samokutyaev. The station has played host to a rotating crew of astronauts and cosmonauts that have continuously manned the station for more than 5,000 days, according to NASA. In 2015, two station crewmembers — NASA's Scott Kelly and cosmonaut Mikhail Kornienko — are scheduled to spend a continuous year onboard the station performing research.